A Natural Union of Movement Philosophies. MovNat provides a coherent, systematic approach to teaching techniques based on movement efficiency principles and biomechanics. It encompasses a great variety of basic, foundational movements and drills usually absent from Parkour training, but that constitute an essential basis for higher levels of movement efficiency. It includes the manipulative skills of lifting, carrying, throwing and catching that are fundamental to a complete physical education program and to a solid overall physical capability. It strongly emphasizes scalability and steady, effective and safe progressions in term of volume, intensity and complexity. Learning the MovNat method for Natural Movement will improve your Parkour coaching ability, ensure better progressions and faster skill acquisition in your students. It will also help prevent injuries. Our method has proven to be especially effective with older students who have been physically inactive for a long time, or haven’t done anything like Parkour, and who really need effective and safe progressions. 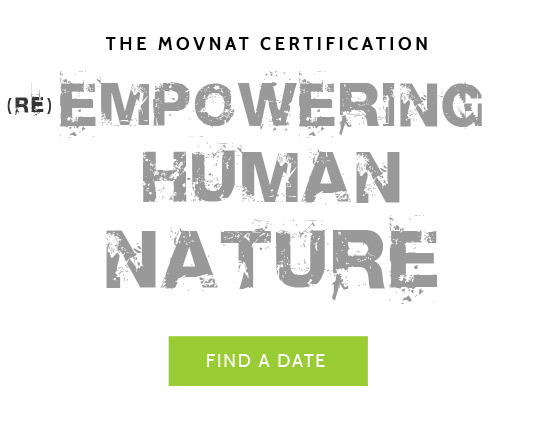 The MovNat certification is a strong credential of teaching quality and competency that will boost your credibility as a coach.